Inspired by the work of Italian artist Benedetta Bonichi, whose images adorn the walls of the Christian Louboutin showroom in Paris; the windows invite customers to explore what lies beneath their soles. 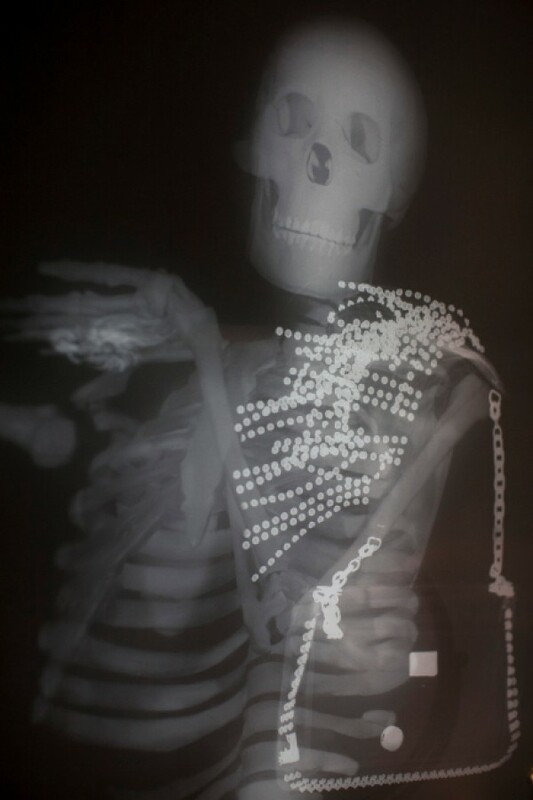 By utilizing authentic X-rays which were created in a London hospital, the brand was able to capture the hidden details and inner workings of shoes and bags in its Autumn Winter 2012 collection. 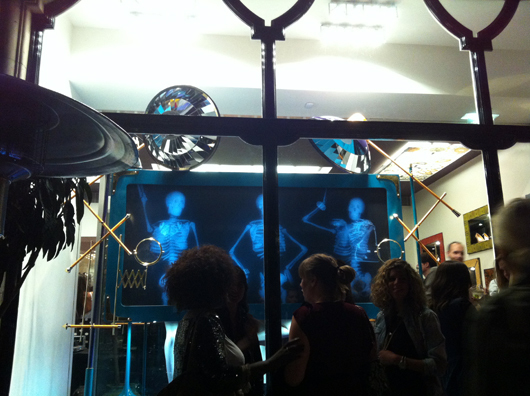 The design team used pulsing sequenced lights and strobes to further amplify the impression of a real Xray taking place in the windows. 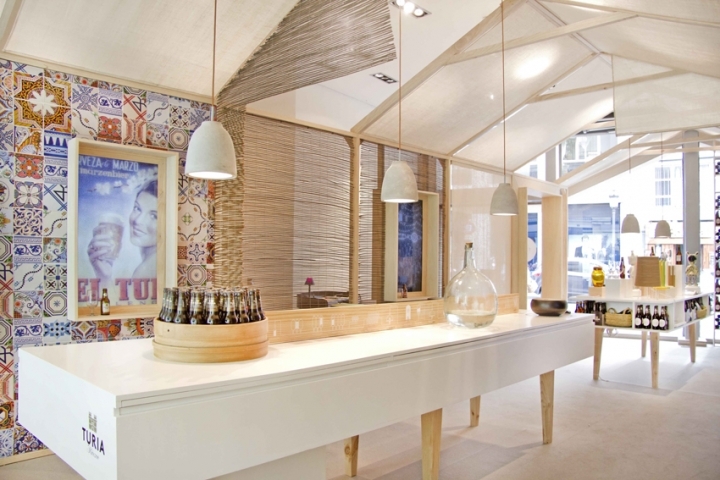 Lamps inspired by a vintage surgical lamp that Christian himself bought many years ago and keeps in his studio were positioned in the windows to highlight the individual products. 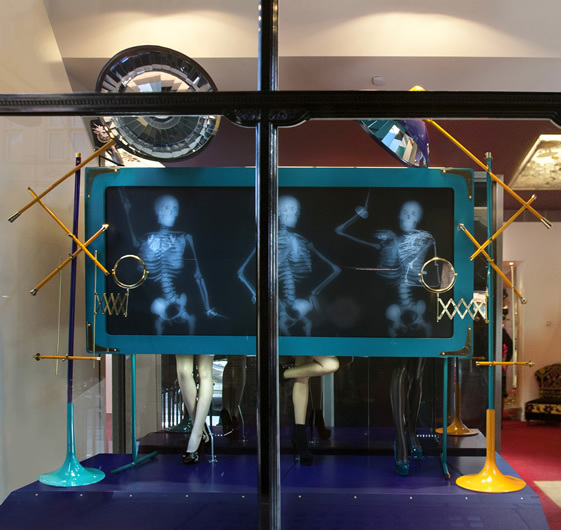 Adding to the fun in the London windows are pieces of jewellery created by British designers Michael Van Der Ham and Holly Fulton, which also underwent the X-ray procedure and hang on jauntily arranged skeletons. 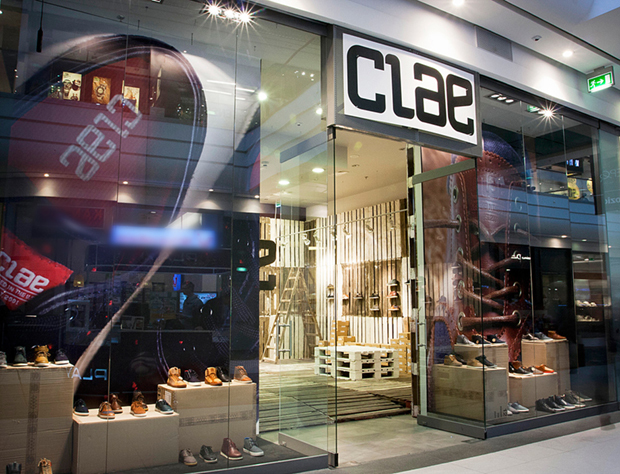 The playful designs were developed and executed in Europe with assistance from retail design agency Studio XAG. 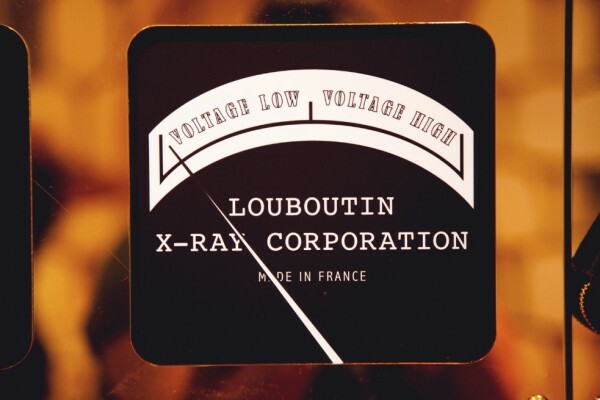 In other global locations where the windows provided a smaller canvas, product X-rays are placed inside glossy boxes highlighting the key colours for the Autumn / Winter 2012 Farida bag collection. A vibrant colour blocking of peacock blue and violet sit alongside Moroccan red and forest green providing a strong backdrop to the shoes and bags. 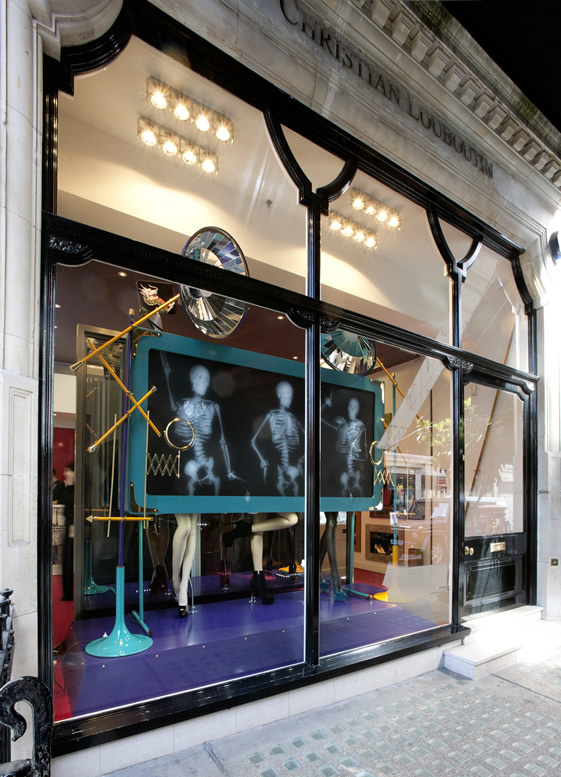 What these windows lack in size they make up for with a unexpected surprise - each of the X-rays provides a tantalizing glimpse of products from the Spring Summer 2013 collection, not yet in stores. 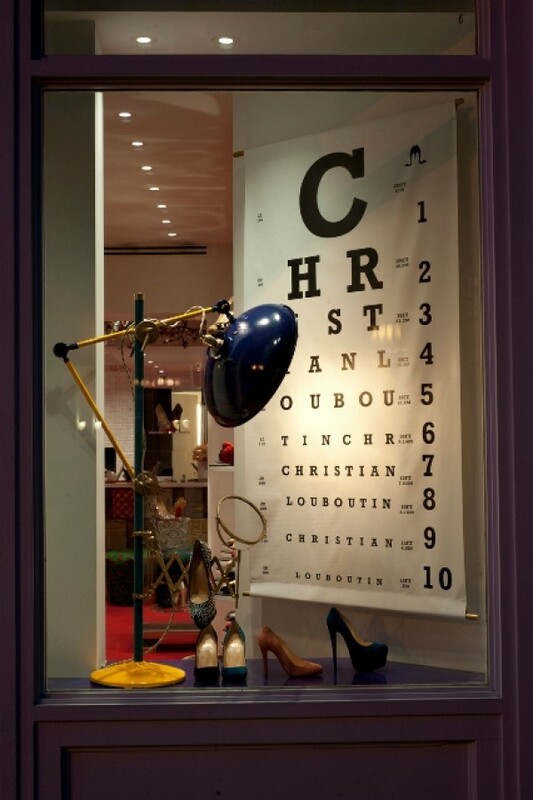 The windows are available to view globally from the USA, across Europe and throughout Asia in Christian Louboutin stand alone Boutiques. inside glossy boxes highlighting the key colours for the Autumn / Winter 2012 Farida bag collection. 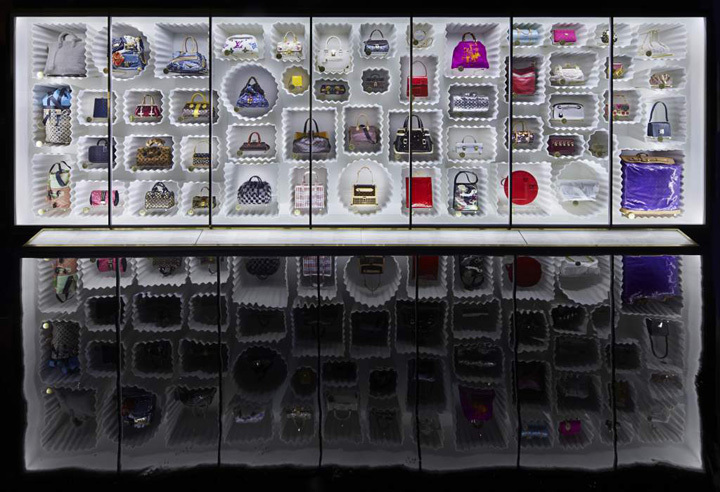 providing a strong backdrop to the shoes and bags. 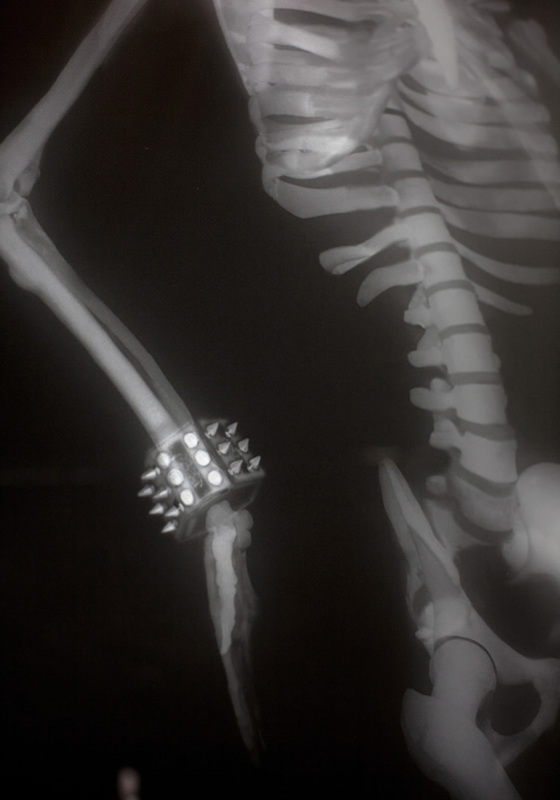 "They went along to a London hospital (possibly feigning broken bones, we’re not sure) with a sackful of Louboutin shoes and bags, some jewellery by Michael Van Der Ham and Holly Fulton, and a couple of skeletons – that’s not an unkind euphemism for models, we mean actual skeletons – and made use of an X-ray machine, capturing the insides, inbetweens and the underneaths of the accessories. 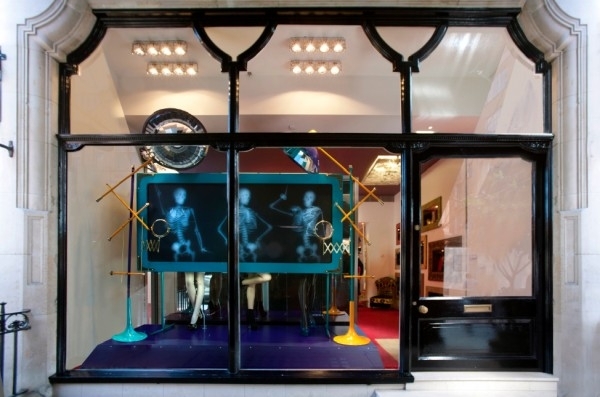 The resulting images, highlighting some often overlooked detailing in the high-end products, have been used in conjunction with some prop legs, strobe lighting and other jiggery-pokery to create the illusion that the X-ray is being taken of real models standing behind a screen in the shop window. The way we see things, it’s another clear winner from StudioXAG."